Governor-elect Ron DeSantis thanked his supporters in New Port Richey on Saturday for helping him win the election. Governor-elect Ron DeSantis launched his "Thank You Tour" of Florida on Saturday, starting in the Tampa Bay area. His rally at New Port Richey's Spartan Manor featured a number of local Republican speakers including Pasco County Sheriff Chris Nocco, state Rep. Amber Mariano of Port Richey and state Senate Majority Leader Wilton Simpson. He is being joined on his tour by Attorney General-elect Ashley Moody of Plant City, a fellow Republican. But unlike their campaign rallies, DeSantis and Moody shied away from the political mantras, and instead shared personal anecdotes with their energized supporters. Moody announced that her son had signed up with the U.S. Army and would be heading to boot camp in three weeks. She also said she is going to have big shoes to fill at work, following outgoing Republican Attorney General Pam Bondi. "Talk about standing on the shoulders of giants, I have to stand in heels on the shoulders of a giant in heels. That’s talent,” Moody said. Moody introduced DeSantis' wife Casey, who discussed the ongoing efforts to 'baby proof' the Governor's Mansion in Tallahassee. The DeSantis' will be the first gubernatorial couple to raise toddlers while in office. When DeSantis took the stage he told his supporters that Pasco County - where DeSantis grew up and where he beat his Democratic opponent Andrew Gillum by more than 17 percentage points - was key to his win. He also touted his close relationship with President Donald Trump, saying the two talked a few days ago about his selection of William Barr for U.S. Attorney General. "I can tell you that [Barr] is a guy who is very, very smart, understands the law, and I think he's going to come to this position as somebody who has been there," DeSantis said. "I think he has the right outlook and I think he has the backbone necessary to do a good job for the people of this county." After the rally, DeSantis spoke with journalists about some of his priorities for his first 100 days in office. His first order of business will be sorting through about a dozen resumes for the three open seats on the Florida Supreme Court. DeSantis said during his campaign that he wanted to appoint "Constitutional originalists' in the mold of judges scuch as the late U.S. Supreme Court Justice Antonin Scalia. He said Saturday morning that continues to be his litmus test. "They have to understand and respect the separation of powers, and that means that the job of a judge is just qualitatively different than that of a legislator," he said. "The current majority on the court has not respected that to the extent that I would want, so that's going to be a necessary condition to get my support." DeSantis also addressed his recommendation of former Pasco County lawmaker and outgoing state House Speaker Richard Corcoran to be the next state education commissioner. That pick has been criticized recent days by Democrats and teachers' unions who oppose Corcoran's vocal support for charter schools. But DeSantis said he thought Corcoran was the best person to help him accomplish his goal of providing more technology-focused vocational training and civics education in public schools. "I think he is somebody who has been involved in education for years and years, and I think he knows it better than anybody," he said. "I also think he's got a record of being very effective. If you look at what he did as Speaker, he got a lot of stuff done." 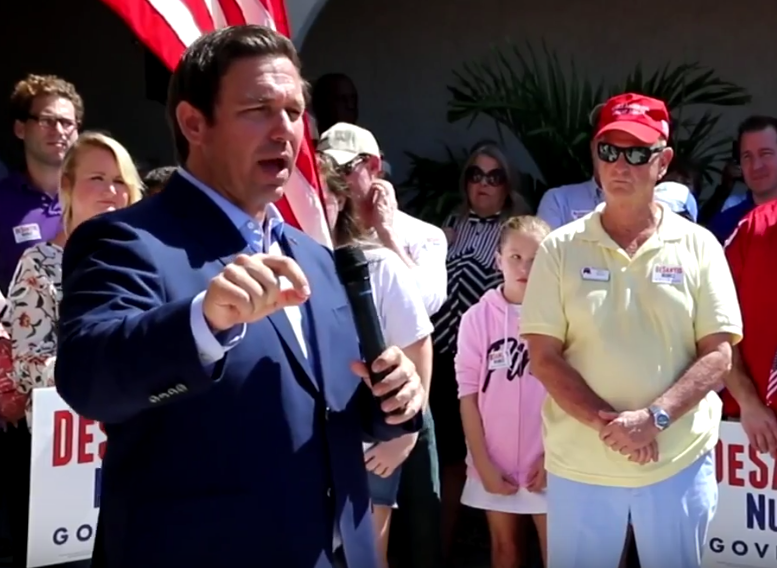 DeSantis followed his New Port Richey rally with stops in The Villages and Port Orange. He plans to take his "Thank You Tour" to every region of Florida before his swearing-in on Jan. 8, 2019. The transition team of Gov.-elect Ron DeSantis is expected to announce a health-care advisory committee as soon as next week. Governor-elect Ron DeSantis today announced he'll nominate outgoing Florida House speaker Richard Corcoran as the state's next education commissioner. The nomination of the Land O'Lakes Republican is no surprise - the possibility has been talked about for weeks, and his fervent backing of expanding charter schools in the state has already drawn the ire of the state’s teachers union and some Democrats.